Click here to see a sample of Black Moon Tonic’s typical playlist. 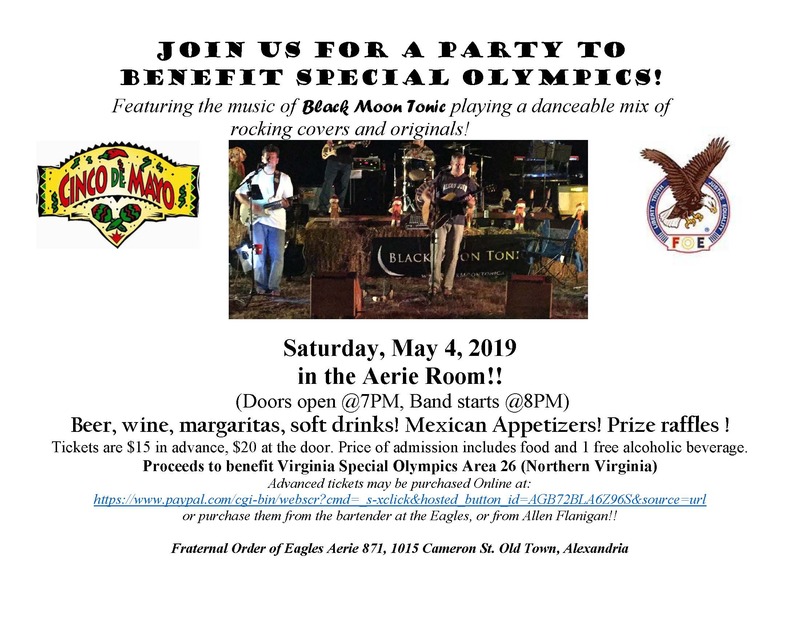 Advanced tickets may be purchased Online at: https://www.paypal.com/cgi-bin/webscr?cmd=_s-xclick&hosted_button_id=AGB72BLA6Z96S&source=url or purchase them from the bartender at the Eagles, or from Allen Flanigan!! April 24, 2019Auxiliary Meeting, 7:00 p.m.
April 24, 2019New Membership Applicant Interviews, 6:30 p.m.
April 26, 2019Shrimp & Wing Dinner, 5:30 to 7:30 p.m.
April 27, 2019Membership Appreciation Night hosted by Newmarket Entertainment, 6:00 to 8:00 p.m.